Literally this is French Corner in Serendra. Way before Duo opened, rumor has it that Billy King’s protégé decided to start a Serendra restaurant. Expect the same level of food quality in their French cuisine but this time I must admit that the service was friendly and accommodating. Don’t be intimidated by the vest and tie wearing waiters, they are ready to serve you. There are a lot of artsy fartsy effects on the wall and most of them are for sale. The photo above is a ceiling painting that gives a French ambiance and entices you to drink some wines. You might be intimidated to eat here because of the prices of the food and the “expat” crowd that it attracts, but reserve this for special occasions. I love the baked sole that I ordered and the “gone-in-a-minute” Duo Surprise dessert. The Fish and Meat that we ordered tasted ordinary though and in fact, my wife was complaining that the Fish tasted like Mc Donald’s fish fillet. I can’t believe it at first, but when I tasted the fish, I felt like somebody stole the Mc Donald’s fish fillet recipe. The steak was tender with the perfect sauce, but we should have ordered the Surf and Turf instead. I’m hoping to go back to get a full taste of a 4 course meal. Lastly, the place is a little crowded and far from the luxury in space that French Corner offers. It feels like the other table can hear whatever you are talking and there is a tiny bar on the mezzanine floor. I like the long rectangular windows view of the Serendra piazza center from the resto. Overall, it is still far from a JSG experience and a toned down Le Souffle, but the Duo promise of excellent food and impeccable service is perfect for that dinner date or a special love one occasion. This is the overall ambiance of Duo. We ate during lunch time so you can only see foreigners enjoying their wine at this time of day. Aidan loved stairs and he can’t resist going to the literally mini bar in the mezzanine floor. If I have the money, I wanted to buy this jester painting! Steak Selection, Chef Creation and Dessert. Fish and Meat (P420). Duo of sliced US beef steak au jus and fried fish fillet in remolaude sauce served with salad and potato. This was a terrible choice. My wife was craving for a steak but we wanted to have something for Aidan. So it was perfect, that they have a Duo Steak specials and we were contemplating to order Surf and Turf or this Fish and Meat. My wife was disappointed that the fish tasted and looked like the fillet o fish from Mcdonald’s without the bun =( I was tempted to get a refund for this but the servers and chef Mau were too nice that I forgot about this ordeal. Baked Sole Fillet (P365++). Stuffed with prawns and mushroom in mornay sauce. I just love this one! And now, I’m craving for some more. The fish tasted imported with the right firmness and texture. I love the crunchy prawns stuffing and onion-flavored creamy cheese sauce with cheese. The vegetables are crunchy fresh and the presentation makes you hungry. I wished that we could have tried different kinds of food… I do hope we can have a chance next time. Very interesting presentation and yummy dessert. This is basically an oreo cheesecake that has a leche plan consistency in the cake but best of all, it is not too sweet. We felt this should be for 3-4 persons but we finished it anyway. Aidan loves to run always these days and we had a hard time containing him to his seat. But we found a solution and he too can’t resist this Duo surprise. Also, he knows that we are taking his picture so usually he won’t look at the camera acting as if no one is watching. Chef Mau and Aidan — the perfect Duo!! We also got a signed Chef hat from Chef Mau. Thanks a lot!! Q. What is the Best Buko Pie in the Philippines? My sister ate at Duo last week and was raving about it to me, so I was happy to see you post about it. Hindi ka talaga nahuhuli! 😉 So was it good, Anton? 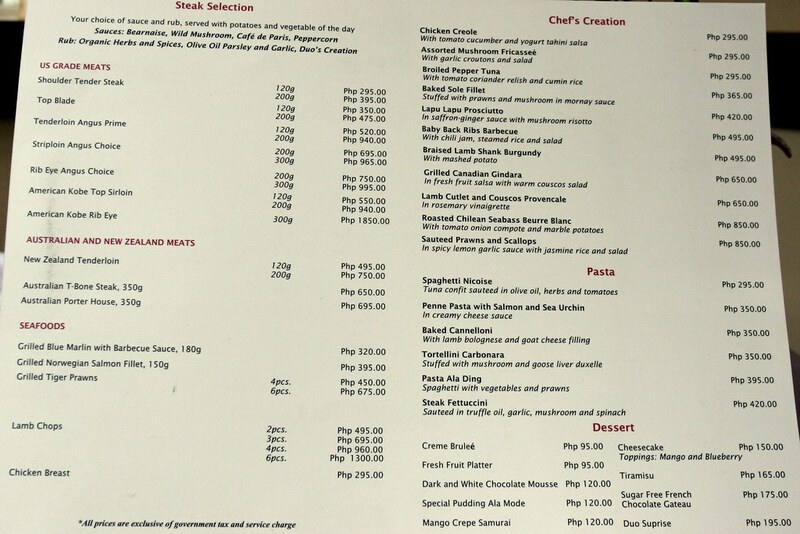 The menu looks great to me — a very good variety, several unique dishes that warrant return trips, and best of all, reasonably priced — especially the steaks. I love how you can specify portion sizes for everything from steaks to salads to prawns; that’s a fantastic idea! You can control both how much you eat and how much you spend. It would be interesting to know what wines they serve. I know the owner’s son, he recommended the restaurant to me.. It was great food and not to mention he was cute. I think you could be a successful journalist and/or publisher. For sure you have the best food blog ! The interior looks impressive and the food looks appetizing. The dessert looks like a work of art. 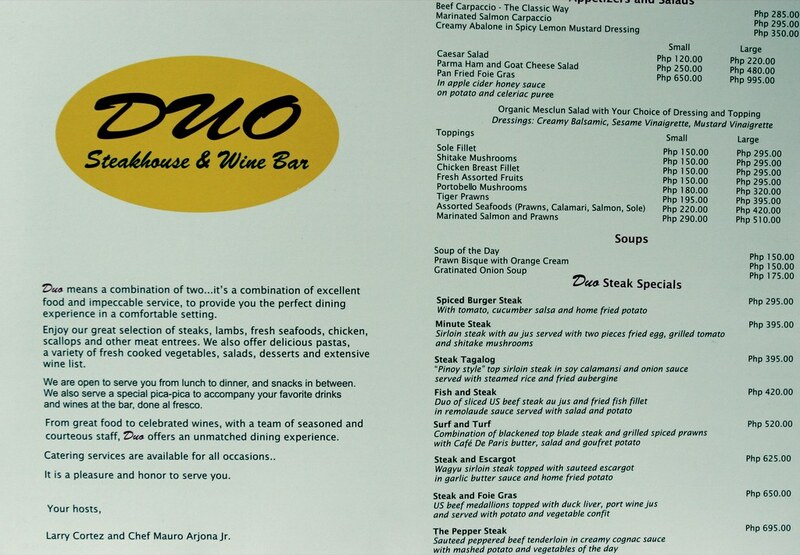 Will definitely go and enjoy Chef Mau’s creations. After Florabel, I am hit again by the uneven seasoning of a fish. I am kicking myself now for just sucking my complaint in and finish my dish. Ha-ay. If I was in a temperamental mood, I would probably raise hell. Mom/Dad got the Lapulapu dish and it was too filling because of the sauce. As for the salad, I don’t think the price equates as value. In fairness though, it was good but the quantity was way below the price you pay. My family and I had dinner at Duo Last night for my mom’s birthday, after my sister, Cris, a foodie, recommended the place. Everyone was very pleased with our Duo eperience. We had the Tessie Tomas Salad and the pomelo and calamares salad for starters. The first salad was really great. The salmon and prawn in it were soooo delicious. Jonathan, our waiter, told us that the explosive flavor is due to the 24-hour marination. The second salad is just so so. For our main course, we had steak and calamares, steak and foie gras, tortellini, spaghetti nicoise, US top blade, and another steak, which name I forgot. The tortellini, stuffed with duck meat, was fantastic. The steak in our steak and calamares was also tender and flavorful. The other steaks were also good. My mom also got a cake and a birthday song! Hmm, what’s the big fuss about Duo? I’ve heard a lot of folks rave about the steak at Duo, but I’ve also heard contrarian tales, so my wife and I decided to sample the place. Not good at all. It seems that they don’t know how to cook their steaks to the proper doneness. I think that they attempt to pan-grill the beef, but it ends up pan-fried. I ordered a medium rare rib-eye and I got a medium one instead. For the price we paid, I should’ve eaten next door at Gaudi. For steaks, nothing beats Fireplace at Hyatt. Do they cater as well for group events? We are planning to arrange around 50-70 guests, can they accomodate? Do they have buffet as well? We went to try this for our Professional Cooking subject report. Quite honestly, it was a disappointment. Maybe because we are students(we also went there right after school). There we were -a bunch of kids. The food wasnt bad but the presention was a far cry from the pictures you have taken here. Plating was bad and redundant. There was no real valu for money. It’s comparable to the food we cook in our lab subjects. the food and service quality is very awesome,it’s great to be there! try to visit DUO and feel the difference…..
I’ve tried Duo and it was good. We went there after buying and searching for Escoffier’s books. German beer was available, I ordered Chicken w/ Pan- Fried Foie Gras and for dessert Sugar- free Chocolate Gateau. It taste good though lacks a bit of fancy presentation, price was fair enough for the dish itself. Over all, not bad. I would surely come back and eat there again. i’ve tried DUO! and i can say that, this is one of the best resturant in the metro…one of my friends ask me if Duo is better than le souffle and i told them its very very DIFFERENT! from food to service quality and the interiors as well,i like its silhouette design! bout’ the price? REASONABLE and IT’S WORTH IT! was there last Saturday. had the grilled red snapper. nothing special about it except for the orange buerre blanc which was really perfect. steaks were good, yes. desserts were amazing! love the tiramisu and cheesecake!